“Millions of adolescents are struggling with low literacy skills and less than half of eighth-grade students are performing proficiently in reading, math and personal finance. This is a call to action for our country,” Vanessa Cooksey, senior vice president of community relations for Wells Fargo Advisors, said in announcing the grant. Teaching students the fundamental principles of money management and careful investment can boost their ability to achieve financial security later in life. A recent $500,000 grant from the Wells Fargo Foundation, a non-profit arm of the San Francisco-based banking and financial services firm, is aimed at reinforcing financial education in schools throughout the United States. The grant is intended to expand participation in the SIFMA Foundation’s InvestWrite® program for Title I schools (under the federal designation for schools with high percentages of students from low-income backgrounds). 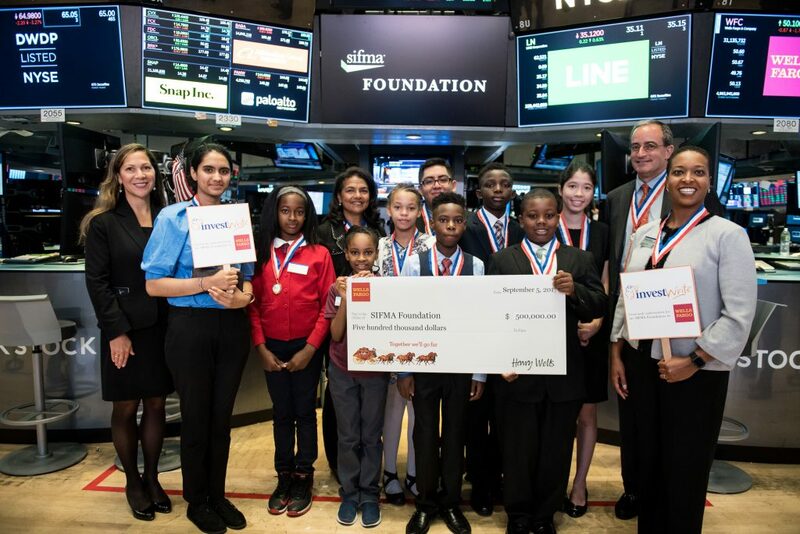 The grant was announced as Wells Fargo executives joined a group of elementary school InvestWrite participants to ring the closing bell at the New York Stock Exchange on September 5. InvestWrite is a companion program to the SIFMA Foundation’s Stock Market Game™, in which students research, buy and sell virtual stocks, bonds, mutual funds, and ETFs in a competitive online environment. Students work together in teams to allocate and diversify their portfolios, manage risk, research industry trends and, ultimately, better understand the role of the U.S. capital markets in the economy. The InvestWrite program takes that progress further by incorporating language arts and writing, challenging students to explain their financial and investment thinking more fully. Participants compose essays focused on a long-term, diversified approach to investing, incorporating research and analysis, current events, market and industry trends, asset allocation and their key recommendations. Thousands of volunteer judges from the financial industry read and evaluate the essays to determine the competition winners. Each year, the SIFMA Foundation’s programs engage 600,000 students and 15,000 educators nationwide with proven success in raising test scores in math, economics and personal finance. A 2009 study of the program by American Institutes for Research found Stock Market Game participants showed gains on mathematics tests and boasted substantially higher scores on financial literacy tests. Wells Fargo has a record of encouraging financial education. Among the recent efforts, the bank’s “Path to Good Credit” project launched in 2015 aimed to help consumers understand how to use credit wisely to grow their net worth and improve their living standards (while avoiding the pitfalls of “bad” consumer debt). Meanwhile, the Wells Fargo’s Hands On Banking® program offers a free financial education tools for youth, young adults, seniors, military service members, entrepreneurs, along with curricula and resources for educators. For Wells Fargo and other financial industry leaders, boosting financial capability among Americans, and in particular among rising generations, may be good business. After all, more people working, saving and investing will lead to a customer base that is better informed and better prepared about the financial choices they’ll need to make. But more importantly, investing in financial capability is the right thing to do.